In a reversal of fortunes for the Islanders defense, the Montreal Canadiens were only able to score one goal, a game after the Coyotes found the net six times. Evgeni Nabokov, the Isles starting goalie, who had missed the past 11 games because of a groin injury, stopped 24 of the 25 shots he faced. However, it was the one goal by Max Pacioretty, which came in overtime, which lifted the Canadiens past the home team. Teammate David Desharnais came around the net and found Pacioretty in front of the crease, as the left-winger was able to chip the puck past Nabokov. Captain John Tavares was sent crashing to the ice 1:41 into the third period, on a shoulder to the head by Lars Eller. Tavares was bringing the puck from behind his own net and with his head down was sent flying. Eller was given a two minute minor for an illegal check to the head. The Islanders would fail to capitalize on the power play opportunity though, one of three chances on the man advantage on the night. The team now is tied for 21st in the league with the New Jersey Devils, having knocked home only 17 power play goals on the season. Carey Price was strong in goal for Montreal, picking up his 21st career shutout. Notes: Ryan Strome made his much anticipated NHL debut. He finished with two shots in 15 minutes of ice time. Eric Boulton got into a fight with George Parros in the first period. Parros would not return to the game, after taking a punch from Boulton that knocked him to his knees. John Tavares and Thomas Vanek had their three-game point streaks snapped. 3 Stars- Evgeni Nabokov- Welcome back to the ice! 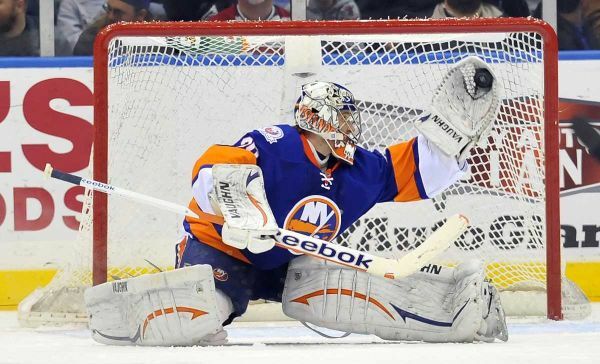 Although he would eventually allow the deciding goal in overtime, helped the Islanders gain a point by stopping 24 of 25 shots. 2 Stars- Carey Price- Garners 21st career shutout in victory by stopping all 21 shots he faced.